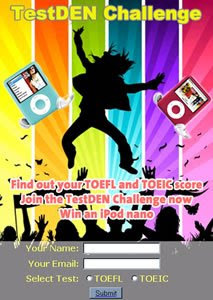 TestDEN Challenge is a new feature on TestDEN.com for TOEFL and TOEIC students. TestDEN Challenge offers 5 mini-tests that take about 30 minutes each to finish. At the end of each mini-test, you get a sample score. The highest scores for each month are shown on the leaderboard. This is a great way for students to quickly evaluate their TOEFL and TOEIC levels so they know how much study time they will need.